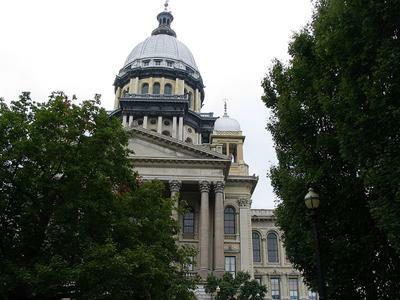 The Illinois State Capitol building in Springfield, Ill.
Illinois lawmakers face some big decisions in the next two weeks, including how much to cut the budget and whether to overhaul workers' compensation. The spring legislative session is supposed to end by May 31, but there are still three different budget plans on the table. They're roughly $2 billion apart on how much to spend. Now lawmakers must decide whether to back one particular proposal or come up with a compromise. Lawmakers are also looking to lower business costs for injured workers. The chief dispute is whether employees will have to prove injuries are job-related. Another proposal could affect the cost of electricity. Utilities are looking for more flexibility to increase rates to pay for investment in new technology.